Elvis Lives is a WMS slot with 5 reels and 60 paylines. Based on the king of rock ‘n’ roll, you will hear his classic songs as you spin the wheels. With oversized symbols, there are 4 main bonus extras which give you free spins with wandering/double wandering wilds and extra wilds. There’s also 2 pick me games with the Elvis Lives Bonus feature potentially rewarding you with up to 2,000 times your total stake. Keep the King’s spirit alive with classic rock ‘n’ roll flare! Elvis Lives is a 5 reel, 12 row, 60 payline slot from WMS that is based on the undoubted K=king of rock ‘n’ roll – playable from 50p to £100 a spin across all devices, it comes with oversized symbols and 4 main bonus features which give you cash prizes, free spins and fixed jackpots up to 2,000 times your stake. Visually, Elvis Lives is rather basic – you’ll see Elvis Presley in the backdrop and hear his famous songs playing as you spin the reels. Symbols on the reels include K, Q and J royals as well as sunglasses, lotus flowers, microphones and belt buckles and Elvis in Concert symbols. You’ll also see 3 Elvis symbols which symbolise a different time in his career – they also pay 2 times your stake for 5 on a payline. There’s also a wild (Taking Care of Business) which performs the usual replacing functions (bar the scatter). On any base game spin, reels 2, 3 and 4 (the 3 middle ones) can merge to form 1 oversized Elvis reel – this contains symbols that are 4×3 in size! This is known as the Elvis Reels feature. Aloha Free Spins feature – you get 7 free spins with Wandering Wild and Wandering Double Wild symbols. The Wandering Double Wild symbol pays double the standard pays. Elvis’ Hound Dog plays as you spin too! TCB Free Spins feature – you get 5 free spins with the green, pink and blue ring symbols acting as wilds. If you get a 3 of a kind win with any ring symbol, a stake multiplier is added to your winnings. There’s also an extra spins feature which gives you more free spins. Jumpsuit Picker Bonus feature – you get 3 picks and choose gems to cash prizes. You can also uncover extra gems which give you more picks – with 3 levels to achieve, there are bigger cash prizes on offer the further you go. If you reach the gem threshold on level 3, you’ll win the fixed jackpot of 500 times your stake. Elvis Lives Bonus feature – here you need to land symbols to light up the Elvis Lives sign above the reel. The more letters you light up, the bigger the cash prize you’ll win. If you light up all letters in the sign, you’ll win the fixed jackpot (2,000 times your stake). 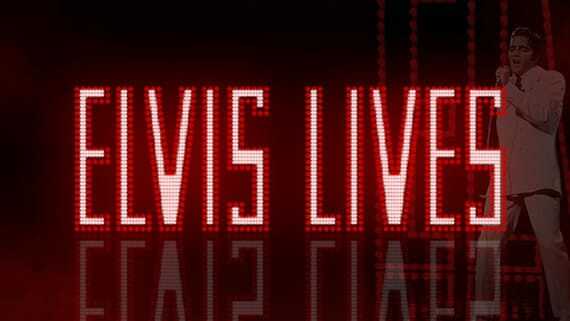 Elvis Lives is definitely an entertaining slot from WMS and a must of you live the King of Rock ‘N Roll! The rewards from the base game and free spins features are pretty low – the bigger wins will come from the pick my style features. The best is the Elvis Lives Bonus feature where lighting up all the letters will give you a 2,000 times stake cash prize. WMS has produced better slots with more rewarding bonus features (such as Viking Vanguard) but, again, this is recommended if you love the King’s music.